Trim the lamb of any excess fat. Melt the butter over medium heat in a large, heavy-bottomed skillet. Brown the lamb all over. Remove the lamb and set aside. Add the garlic and onions to the pan and cook for a few minutes. Then add the spices. Once all is fragrant, return the lamb to the pan, with just enough hot water to cover everything, and bring to a boil. Turn down the heat and simmer gently for 30 minutes. Check on the lamb, turning if needed. Add the honey, saffron, and quince to the pot. Using a vegetable peeler, add a few pieces of lemon rind to the pot, and a generous squeeze of lemon. Cook for another 15-20 minutes, and remove the lamb, setting aside. Turn up the heat on the sauce to a rolling boil and reduce for about 10 minutes. Taste, and adjust the seasonings. I added some of the quince poaching liquid for sweetness! 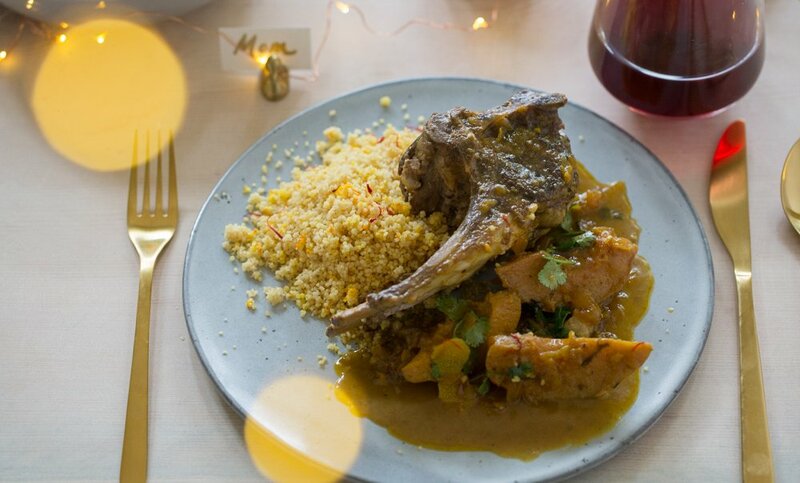 Once perfect, serve with the lamb, adorned with cilantro, over couscous.